We learned to talk to EVERYTHING, including the plastic rabbits and garden gnomes people insist on displaying. Addy was caught last weekend, literally yelling, "HI", "HI", "HIIIIIII" waiting for it to answer her. We learned to play yard games....well, atleast play with all the equipment for yard games. We learned we LOVE peanut butter and jelly (especially the jelly). We learned to walk like a super model. The girls will be doing their flower girl debut next month and we've been "practicing". Notice, that even while walking like a supermodel, Addy is still holding a ball of some kind. We learned picnics in the park are a blast and we CAN sit still long enough to eat a meal without being strapped to a chair! We learned that we LOVE babies! Here are the Jones twins, who visited last week. The girls were totally enamored, wanting to help with everything. This lesson also led to mommy learning that 2 is plenty for me! 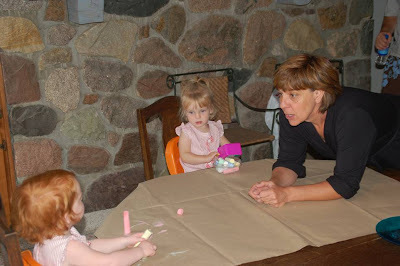 We learned that craft time with Grandma Jody is the best. She makes her own playdough AND lets us chalk INSIDE the house. 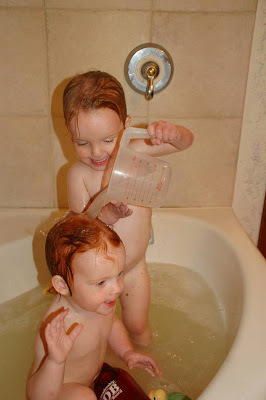 We learned to wash each others hair in the tub! So cute!!! What a great post! These are really cute pics! Oh how time has flown this year!! Sniff, sniff...can't believe they are almost 2!! They have grown so much! We had a great visit ... so fun to see how much they have learned! Good times with old friends..